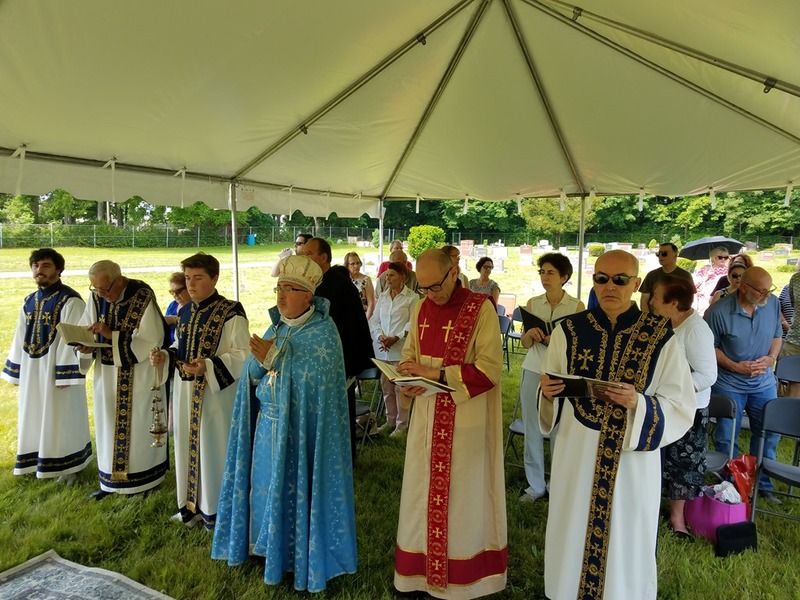 (South Milwaukee, WI) On Sunday, June 17, over 85 Armenians from Southeast Wisconsin gathered for Outdoor Divine Liturgy and a madagh (memorial) meal at Holy Resurrection Armenian Cemetery in South Milwaukee. The date, Father’s Day, was chosen as an occasion for remembering the founding fathers of the cemetery as well as family members buried there. It also coincided with the 70th anniversary of the cemetery’s consecration. South Milwaukee played an important role in the history of Armenian immigration to the U.S. As an industrial suburb of Milwaukee, South Milwaukee was one of the first destinations for Armenians fleeing the massacres of the 1890s because of the enormous need for factory workers at Bucyrus Eerie, one of America’s largest manufacturers of mining machinery before its purchase in recent years by Caterpillar. The first wave of immigrants was joined after World War I by an influx of Genocide survivors. St. Mark’s Episcopal Church was the site where visiting Armenian priests conducted liturgy in South Milwaukee until 1924, when the growing community established Holy Resurrection Armenian Church. The city’s Armenians were buried in St. Mark’s cemetery until 1948, when the community purchased the plot of land adjacent to St. Mark’s cemetery, that became one of only a handful of Armenian cemeteries in the U.S. The June 17 liturgy was celebrated by Very Rev. Fr. Simeon Odabashian, Vicar of the Eastern Diocese of the Armenian Church. He was assisted by Rev. Fr. Sahak Kaishian of Holy Resurrection and Rev. Fr. Nareg Keutelian of St. John the Baptist Church of Greenfield, along with deacons and choir from both churches. In his homily, the Vicar confessed that he had never previously performed liturgy in a cemetery, but upon reflection, realized that Christian worship began, in a sense, in a cemetery at the empty tomb of Jesus on the first Easter Sunday. Afterward, he conducted a requiem for all souls buried in the cemetery, including Very Rev. Fr. Soukias Kalfaian, pastor of Holy Resurrection’s parish for many years, and performed the blessing of the madagh, provided by Mr. Mark Keishian, a longtime parishioner of Holy Resurrection. 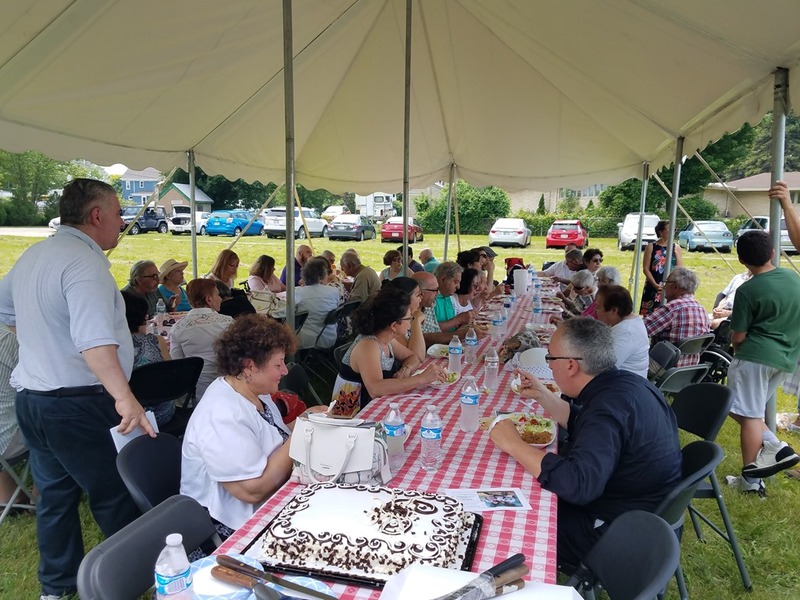 During the Madagh luncheon on the cemetery grounds, the Mayor of South Milwaukee, Mr. Erik Brooks recounted the great contributions the early Armenian settlers made to the city and commended their descendants for continuing in their forefathers’ footsteps.